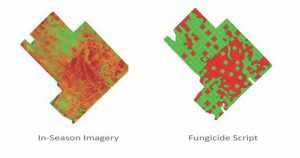 You will receive one data collection through UAV or Drone (remote sensing), plus a Fungicide Script which will automatically distribute your fungicide more efficiently, reducing the amount where it is not needed and increasing it where it is. The net result will be either a decrease in overall fungicide used, or an increased in yield potential. In addition, you will receive a post-season analysis on the scripting effectiveness. The all-in pricing for a package that includes the UAV data collection and a Fungicide Script, plus a post-season statistical analysis is only $4.49 per acre. You get both a complete, more accurate application for your nutrient program and an extra data layer, which can be used to further enhance your precision agriculture programs today and in the future.